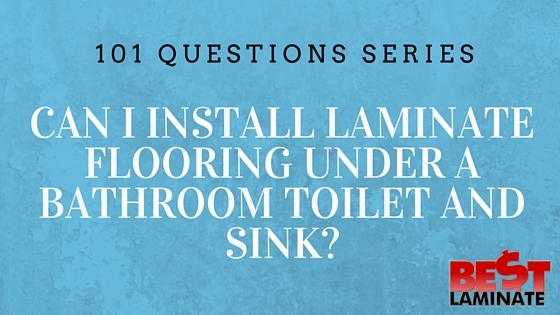 Home >> 101 Questions Series >> 101 Laminate Flooring >> Can I Install Laminate Flooring Under A Bathroom Toilet And Sink? You’re finally doing that new bathroom renovation! Awesome! 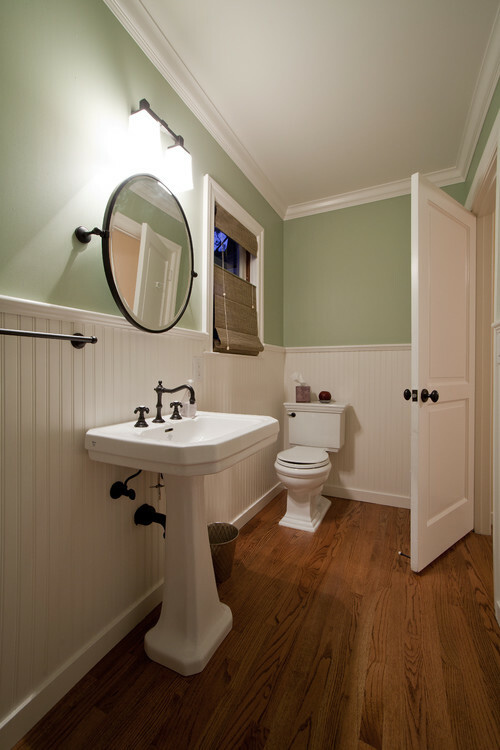 You’ve decided on the laminate flooring, the perfect pedestal sink, and a brand new toilet. But you know that laminate flooring isn’t waterproof… so, do you install the flooring under the bathroom toilet and sink, or do you cut around it? If you’re installing a new floor, pedestal sink, and toilet, you should install the laminate flooring first so it’s under the sink and toilet. Because laminate flooring floats above the sub-floor on top of underlayment, it will expand and contract slightly with the temperature and humidity of the room. This makes it impossible for any caulking around the base of the sink and toilet to hold. If you were to install the toilet and sink first, the caulking could crack due to the expansion and contraction, making the installation look sloppy. By installing the flooring first, you will also be able to more easily switch up cabinetry or fixtures, without having gaps in the flooring. If you’re installing cabinets or a vanity that is fixed to the flooring, you will install these first. A laminate will not be able to float under a cabinet. Install the cabinets and then use a finishing molding around the edges to cover the expansion gap. How Do I Install The Flooring Properly? Precision cutting is key in this type of installation. Cut the flooring around the drains fairly close to the hole. When you install the toilet, screw it down snugly, but not overly tight. If you’re installing a pedestal sink, while it’s heavy, the floor should still be able to expand and contract properly. The most important thing is not to push the baseboard too tight to the floor, and to leave the proper expansion gap, when you install the flooring and molding. This is what allows the floor to expand and contract with changes in temperature and humidity. If you’re worried about water spilling, you can add a waterproof glue to the locking system joints while installing. This will help create a more water-tight seal between planks, which is where the floor will be the most prone to water damage. If you have additional questions on how to properly install laminate flooring in a bathroom, feel free to ask them in the comment section below! We would love to help you! For those planning to install a new floor, toilet or sink, you should remember to install laminate flooring under the sink or the bathroom. The floor helps you to fix the sink and toilet without leaving any gaps on the floor. Hi Carola, great question! Does the vanity come the whole way to the floor like a kitchen cabinet? If so, we’d recommend installing the vanity first and then doing the flooring so it does not go under the vanity. What about a vanity that has feet? Would that be ok if I put felt pads underneath so the floor has at least a small opportunity to move around a little for expansion and contraction? Thanks! Hi Scott, thanks for reaching out. A vanity that has feet in no problem. Keep in mind, when you install the toilet in your bathroom, the floatation of your flooring will be very limited once the toilet is bolted to the ground. Please make sure there is a transition piece separating the bathroom from the rest of your home, to prevent any buckling or damage to the joints outside of the bathroom. Please let us know if you have any other questions! Hi Kevin, unfortunately not. Since a laminate is made from wood, it will absorb moisture, water and humidity causing it to buckle. We only recommend using laminate in a half bathroom. In this case, we’d recommend going with a vinyl or tile floor. My laminate has sinking and soft spot near my toilet. Hi Susan, we’re sorry to hear about this! I have a feeling this may be a water issue. Did you notice any leaking or sweating of your toilet?